Ballymena United’s debut boy Kevin Braniff can’t wait for next month’s Tennent’s Irish Cup showdown against rivals Coleraine. The talented striker, who marked his debut for David Jeffrey’s side with a brace in their 3-1 win over Harland & Wolff Welders on Saturday, is expecting another tough test against Oran Kearney’s men. The Blue Ribbon competition has been kind to Braniff, who in Glenavon’s cup final win over Linfield last season and he’s hoping that his luck continues with the Braidmen. “It has been pretty good to me over the last year, so hopefully it continues,” he said. “I was just happy to get back playing again and I enjoyed it, obviously getting a couple of goals always helps. Over the years, the 33-year-old has played in the Mid-Ulster derby for both Portadown and Glenavon and now he can’t wait to experience next month’s derby. 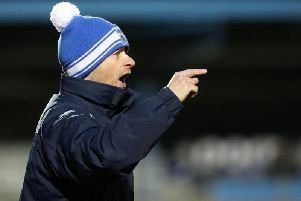 “I have been involved in Glenavon/Portadown derby over the years on both sides but this is going to be my first experience of the Ballymena/Coleraine derby, so I’m really looking forward to it,” he added. “Hopefully it’s as good an experience as it has been over the years when I have been at both Portadown and Glenavon. With three all-Premiership ties in the last eight, Braniff knows some big clubs are going to get knocked out. “There’s big teams who are going to go out but that’s what happens when you get to this stage of the Irish Cup,” he said. “We all meet each other now so it’s about getting over the line and getting into the hat for the next round.